Marquez Tatum gives his fellow barber, Chris Lee, a quick haircut during a lull in the action of his busy shop. 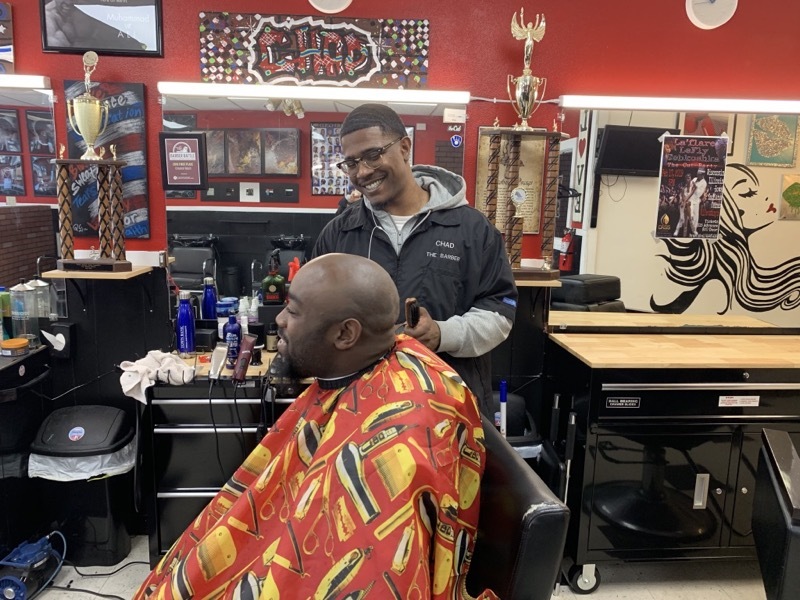 Published Feb. 13, 2019 at 3:01 p.m.
Marquez Tatum gives a lot of haircuts at his barbershop, Quez Creations. On a typical Friday and Saturday, Tatum says more than 100 people walk through the doors of his shop, 4479 N. 76th St. Entire families come in for a cut, with or without a reservation, says Tatum, who employs two other barbers. 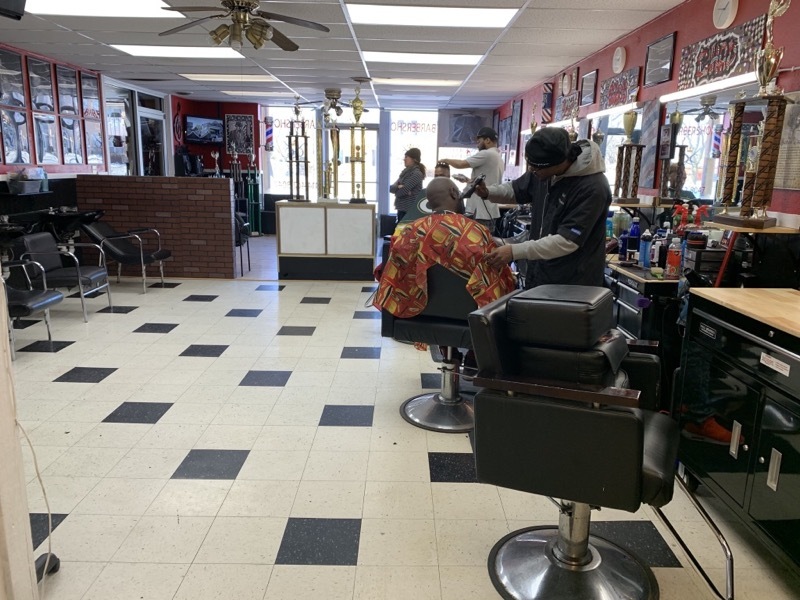 "A typical day at a barbershop, especially African-American, can be full of surprises," says the barber, who trained at the Institute of Beauty and Wellness (an Aveda school) but opened his own shop in 2016. "Especially men, they don't really care for the appointment thing," says Tatum, not at all distracted by this interview. He talks quietly while he uses his clippers like a paint brush, etching in fine detail work on his fellow barber, Chris Lee, while the tape rolls. 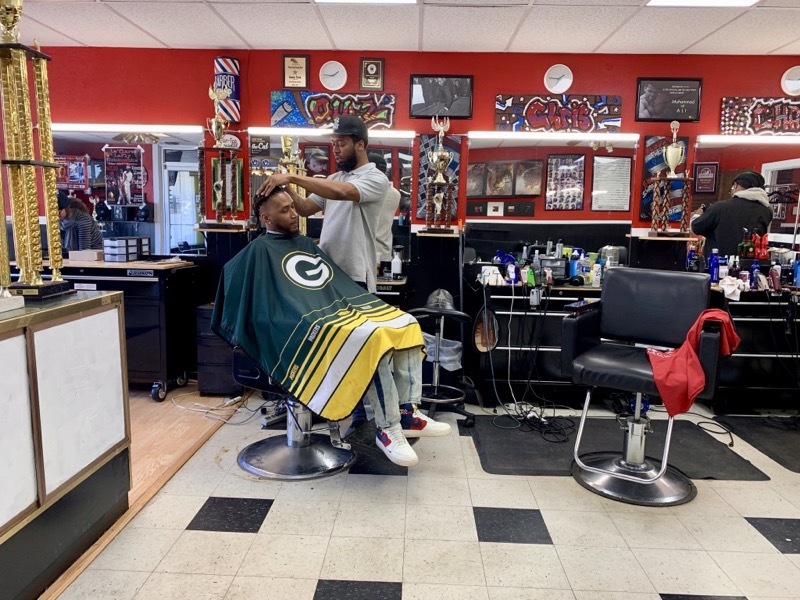 "When they come to a barbershop, it is an experience for them, for the most part. Sometimes, some come in just because they want that conversation. It's a getaway from home. This is the man's hour, our moment, just to have to ourself. It's all different type of reasons, different things that go on in the shop. People come through selling things, or just trying to even promote, maybe, their own business." In other words, Tatum is almost a therapist to his customers – but he also cuts their hair. 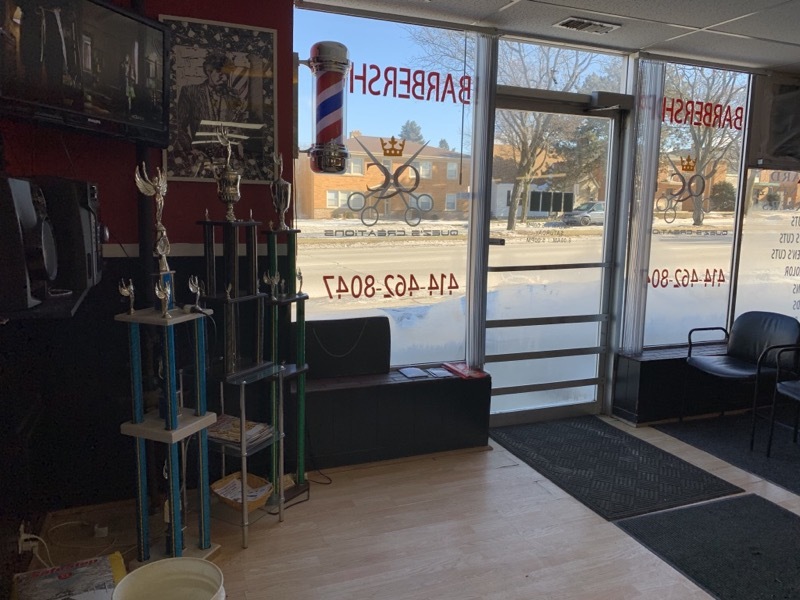 Says Tatum, "I always say barbers are the most underpaid, because for the same counsel we give them, they go pay someone else thousands of dollars. In our service, we only get $25. We have not just changed their image, we done changed their life." 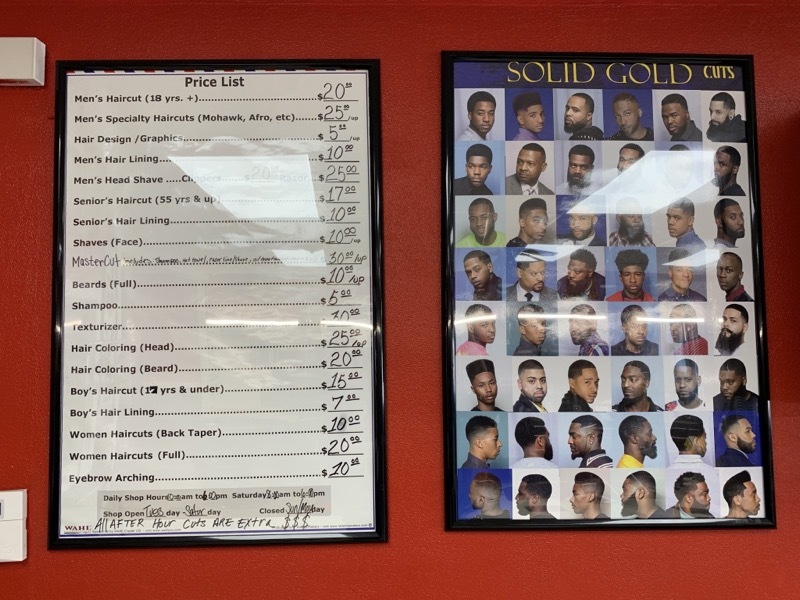 Looking at the shop's wall of photos, one quickly realizes that $25 is a bargain for this kind of haircut. Tatum, Lee and Chad Worthington, who all met at Aveda when Tatum was an instructor, carve intricate designs into their clients' hair – almost like tattoo artists with clippers. "I know barbers who may get $50 a haircut, says Tatum, setting down the clippers to survey his shop. "I know others get a couple hundred for a haircut. It depends on the shop. It depends on the barber. It depends on the location. Sometimes, it depends on the individual." Lee says he saw something special in the way Tatum cut hair – but first he saw his classmate, Worthington, make the jump to Quez Creations. Says Lee, "When Chad graduated, he eventually decided to come here. It made me pay a little bit more attention to him to see what he had going on over here. I was already captivated by the way he was able to teach at Aveda, just how he made it simple. I was trying to figure out more about what he had going on. I definitely felt drawn. It was a reason why I met him." All three live in the neighborhood they serve; from the outside, Quez Creations is an unassuming storefront. 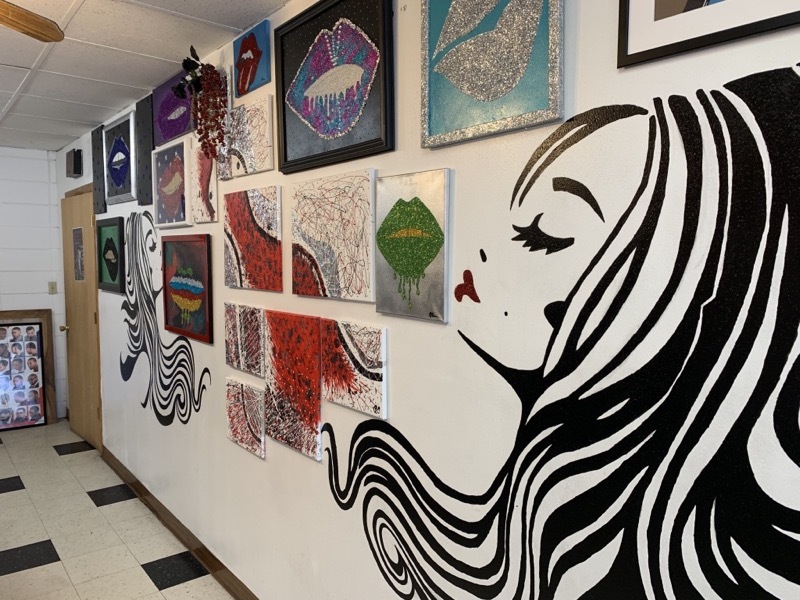 Inside, it's filled with artwork that Tatum created, as well as a myriad of products and clippers you don't typically see at a shop that caters to white customers. It's important, Tatum says, to give back to his neighborhood and community. "We did a giveaway event," says Tatum. "We gave back book bags and free haircuts this summer, right before school started. 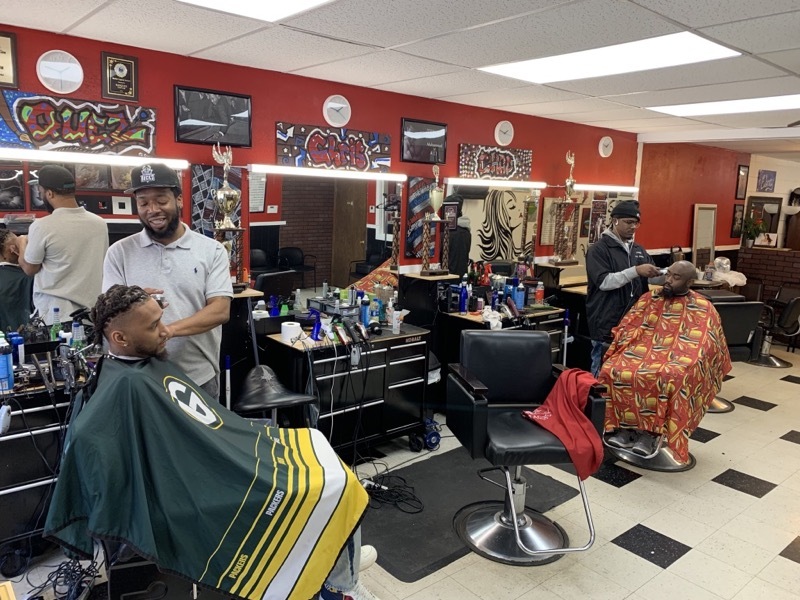 It's always a blessing to be able to give back, especially for a barbershop, because barbershops was always the cornerstone of the community. There was a time where you went to the barbershop that was in your neighborhood. Now, because of social media, we kinda stretch it out now. We go across town to try to get the best haircut we could possibly get." 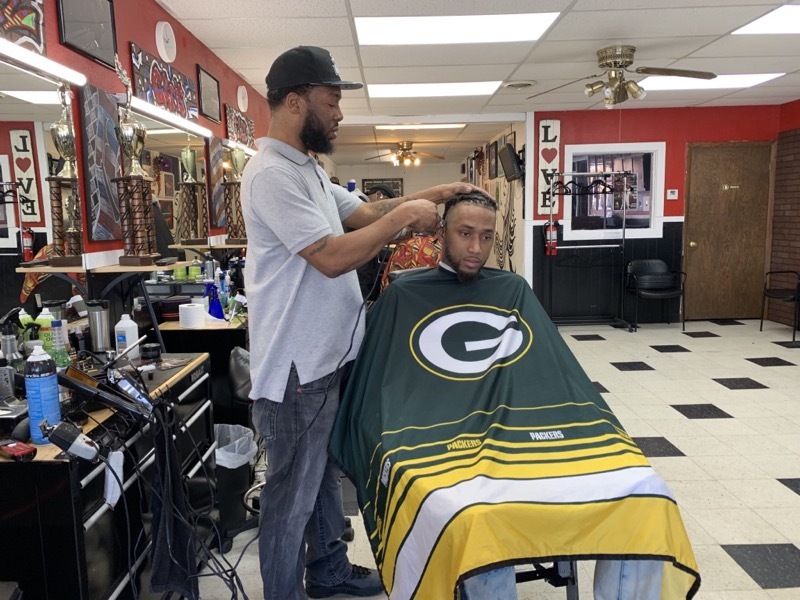 When he's not cutting hair on the north side, Tatum is traveling nationally to haircutting competitions and showcasing his skills on a bigger stage. Since 2006, Tatum has competed – and won – barber shows all over the country. 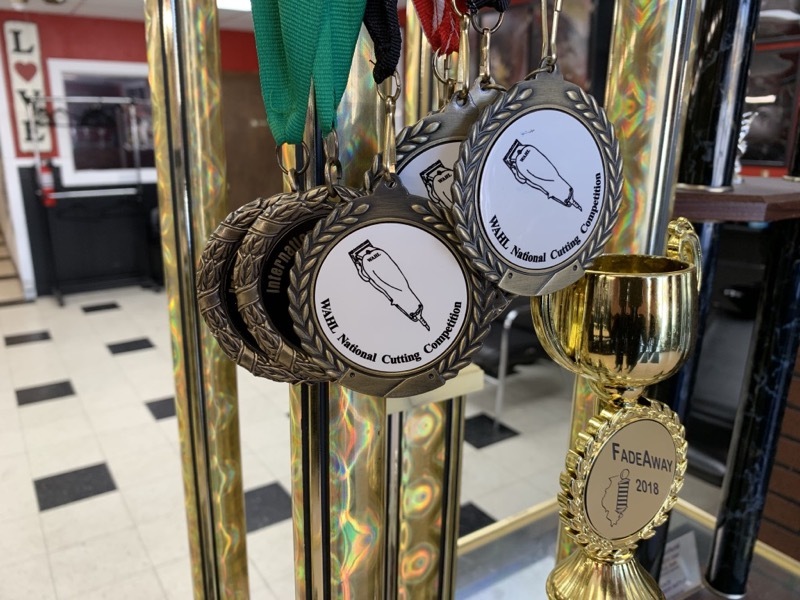 Competing on speed, precision and total look, he has taken home prizes in Chicago, Atlanta, Baton Rouge, Louisiana, Lake Charles and Austin – to name a few. 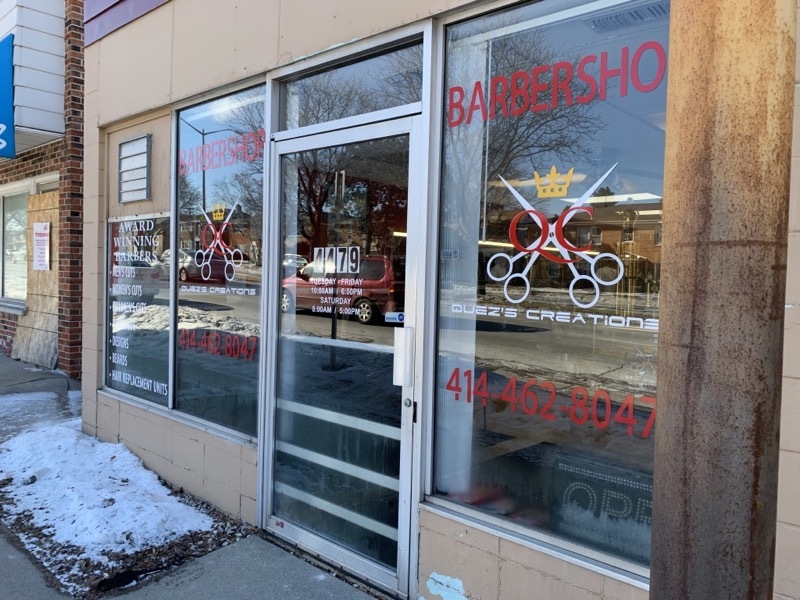 Now, on Feb, 17, he will bring a "cut party" to Oasis Lounge, 3120 W. Villard Ave. Barbers from across the region will come and showcase their skills, but the atmosphere will be more like a party than a technical competition. "With this cut party, we wanted to still do a hair show, but we want to take it up a notch and give the people what they want," says Tatum. "They want to see them do a live hair style. This time around, they'll have one or two models. They'll do it on stage, live in front of everybody." Tickets for the cut party are $15 in advance, or $20 at the door. The party kicks off at 5 p.m.
Says Tatum, "It's not your typical 'people sit off in the crowd and they just watching.' The crowds will actually be more engaged this time. They'll be probably standing around the stage. The crowd will be able to go up and ask the person questions. You know, then, you'll have people just having fun, dancing."